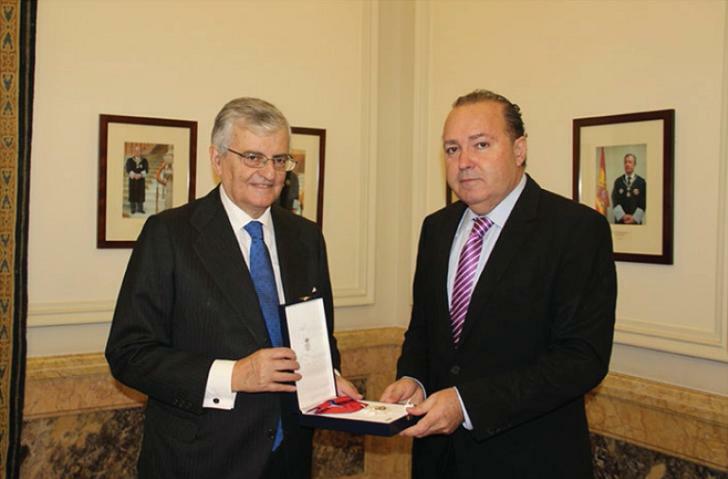 The past February 20th, in the General Prosecution Headquarters, in Madrid, Francisco Legaz, Chairman of Diagrama Foundation attended the act where he was honoured with the San Raimundo de Peñafort Order Distinguished Cross Second Class, an acknowledgement that has been given by the Ministry of Justice of Spain for his remarkable contribution to the development and improvement of Justice in that country, especially regarding Juvenil Justice. The General Prosecutor of the Spanish State, Eduardo Torres-Dulce, personally awarded this distinction, emphasising in his speech that it is necessary that there are “people like Francisco Legaz, who has dedicated his life to promote Justice and defend citizens rights, especially in the infant world”, because that way “social coexistence is cultivated and we preserve a society fringe that will be the future”. The act, which was chaired by Mr. Torres-Dulce, counted with the presence of several Spanish Judicial representatives. During the speech, Eduardo Torres-Dulce foregrounded the importance for Prosecution to be able to rely on the civil society in the Juvenil Justice ambit, which “is absolutely essential for the consolidation of a fairer, freer and more equal society”. Meanwhile, Francisco Legaz, rendered thanks for the concession of the San Raimundo de Peñafort Cross, highlighting the participation of over 400 Juvenil Justice professionals who have backed up the nomination. In his speech, Diagrama Foundation’s Chairman remarked that “Justice is an indispensable value to talk about coexistence, respect, freedom and society”, spotlighting his commitment and his firm conviction that, working for and through Justice, we are building together a world of citizens with equal rights and opportunities and, therefore, with a worthier future”. You can read Francisco Legaz's speech on the attached file.